Every Peanuts character is there with their famous quotes and the classic theme song and I was immediately transported back to my childhood. For older generations, The Peanuts cartoon is a classic comic that fills us with a sense of nostalgia as soon as we see those lovable faces. Based on those memories, the idea of putting together a full length film probably seemed like a good one. Tapping into the past with a built in audience while allowing adults to introduce their children to characters they themselves grew up loving. It's practically a no-brainer. Sadly, I don't think it worked as well as they expected by the time they had a finished product. The gang is all there from Charlie Brown (Noah Schnapp; Bridge of Spies), to Linus (Alexander Garfin; Law and Order: Special Victims Unit), Lucy (Hadley Belle Miller; Sophia The First), Marcie (Rebecca Bloom; Masha and the Bear), Peppermint Patty (Anastasia Bredikhina) and even the little red haired girl (Francesca Capaldi; Dog with a Blog). Their signature lines are included, as well, along with the iconic theme music. Snoopy and Woodstock (Bill Melendez; You're a Good Man, Charlie Brown) are also prominently featured. The film has all the elements to make us, once again, fall in love with our beloved characters, but The Peanuts Movie just doesn't completely deliver. At first, I had high hopes for the hour and a half long movie, but it seemed to fizzle part way through. Every character is there with their famous quotes and the classic theme song and I was immediately transported back to my childhood. We see them all playing on the frozen pond during a snow day only to discover a new neighbor moving in. The next day at school the little red-haired girl walks in to the classroom and Charlie Brown is smitten. He then spends the next hour trying to impress her, only to suffer a series of mishaps at every turn (as he always does). Adding to the lack of story is Snoopy's side tale about the Red Baron. Again, at first it is cute and nostalgic, but, Director Steve Martino (Horton Hears a Who! ), added too many Red baron Snippets and eventually it got annoying. I'm not sure if he was trying to simply stretch out the film to make it longer, but some of the Flying Ace's scenes were wholly unnecessary. The Blu-Ray boasts over an hour of extras and, frankly, some of those were unnecessary as well. The theme song sing along is cute for little kids (those who can read) and even the actual music video with Meghan Trainor is fine, but I'm not sure the "making of the music video" needed to be added. There is also a montage of all Snoopy's scenes that could have been left out. The 30 minutes of insight into Charles Schulz and how his team and Martino approached the film was interesting enough. 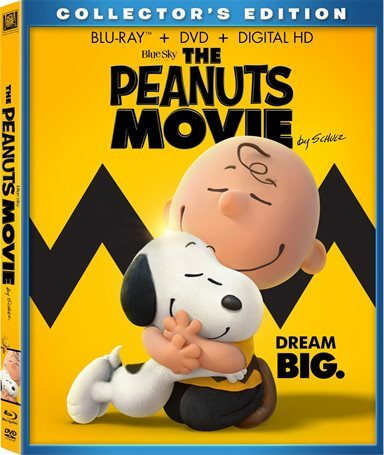 The Blu-ray/DVD/ Digital HD combo pack also came with a cute little Snoopy plush that almost any kid will like. The High Definition 1080p video was exceptional. The hues were magnificent and the animation was terrific. The DTS-HD Master Audio 7.1 was also stellar. Every line was clear and the songs were delivered with the full range of notes. Even the whiny trombone of the adults' voices was sharp in its "muffled" madness. The movie tried too hard to be more than the hour long TV specials we know and love and it just didn't work out. It does have a nice message at the end about being more than you think you are, which leaves you feeling good. I think every person alive should watch the movie at least once… the older individuals to relive some of their childhood and the younger ones to experience what we adults love so much about Peanuts. However, I'm not sure this is the Peanuts movie I want to signify the cartoon of my past. I'd rather find a copy of It's the Great Pumpkin, Charlie Brown. Download Peanuts from the iTunes Store in Digial HD. For more information about Peanuts visit the FlickDirect Movie Database.